Visitors to the memorial can scan the QR code and view Virtual Memorial videos of six fallen service members. The Veterans Media Center of San Francisco created the Memorial videos to go with Veteran Stone smartphone viewer app. Read about the monument unveiling. Napa Valley Register, September 30, 2012. A few hundred people gathered Saturday at Veterans Memorial Park to dedicate a memorial honoring service members from Napa County who have died in the wars in Iraq and Afghanistan. 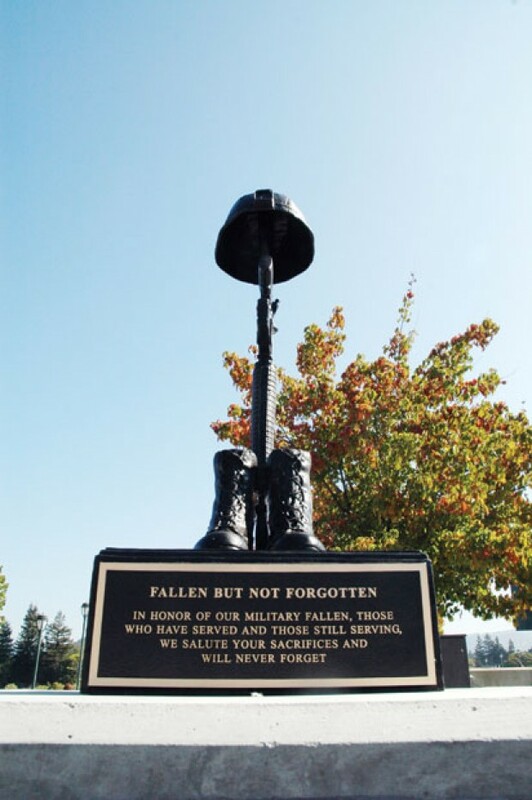 The monument, named “Fallen But Not Forgotten,” was unveiled Saturday at the corner of Third and Main streets, thanks to the efforts of Alyssa DeBenedetti, a 2012 Napa High School graduate who proposed the monument and spearheaded the project. Categories: Events, Projects, Veteran Stone | Tags: Afghanistan War, Alyssa Debenedetti, Downtown Napa, Fallen But Not Forgotten, Iraq War, San Francisco, Veteran Stone, Veterans Media Center, Veterans Memorial Park, vmcsf.org, War Memorial | Permalink.